The race began in the parking lots of the Meadowlands Sports Complex and lead through the roads that circled the complex. Unlike the NYRR races that run through Central Park, there were no trees, no shade and no reprieve from the sun. Baking in the sun made it a little rough, and they put out multiple water stations to accomodate for the heat, but the sun streaming down on the blacktop while running made for a very dehydrating run. As we curved around towards the Metlife Stadium, we were able to get some shade from the stadium and the trees planted right out front, until we turned to enter the stadium. Once inside, it was a curve around the astroturf and a straight run down a limited width channel for 100 yards to the endzone and 3.1 miles. Even with the heat and slowing down at the second mile marker to get some water at the water station. My official time for the 5K was 25:36. Not my personal record – PR – but a time I’m happy with due to the heat and the two hills we needed to run up around the complex. It gives me something to strive for next time, in order to improve. 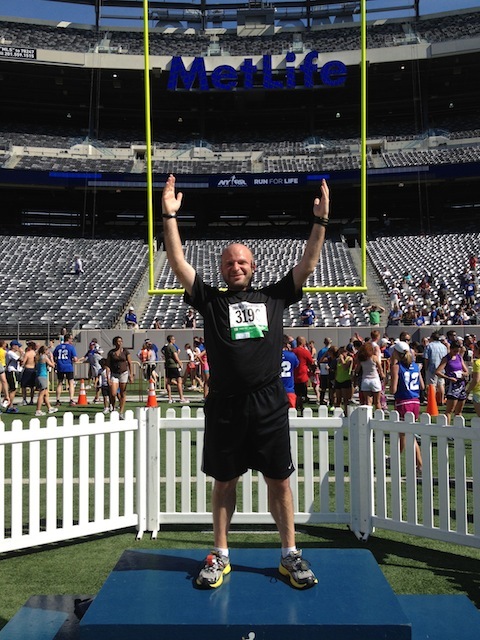 Heat not withstanding, the Giants Run Of Champions 5K was a fun race. Normally I don’t like to do the costuming or gimmicks while running, but I liked the idea that some people had to run with a football. Perhaps next year, I’ll pick up a ball to run with so I can say I ran a football 100 yards down the field to a touchdown, since I’ll never actually be able to do it in a game.